Fox fighting Duon on the ship's bridge. Battleship Halberd Bridge (戦艦ハルバード　ブリッジ, Battleship Halberd Bridge) is the 25th stage in the Subspace Emissary of Super Smash Bros. Brawl. The stage immediately follows the events of Battleship Halberd Interior and Battleship Halberd Exterior. 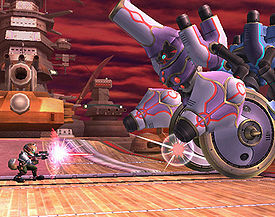 The group consisting of Snake, Meta Knight, and Lucario fights its way through enemies of the Subspace Army until they reach the Halberd's bridge. Here, five Shadow Bug copies of Mr. Game & Watch (the only time in which a hero doesn't have its name shown when introduced) are seen piloting the ship. Snake charges and knocks all of them off of the bridge and onto the deck below, disturbing the tea party Peach, Zelda/Sheik, and Fox were having. As the clones make contact with the deck, they revert to Shadow Bugs, which all merge together to form the monstrous machine Duon. Zelda/Sheik, Peach and Fox get up to fight it and are joined by Snake and Lucario from the Bridge (Meta Knight stays on the bridge to regain control of his ship). A last minute addition to the team is Falco, who ejects from his Arwing to land on the deck. Once Duon is defeated, the Shadow Bugs dissolve to reveal a trophy of Mr. Game & Watch. Fox aims his Blaster at it, but Peach walks past Fox, smiling. She then revives Mr. Game & Watch. The confused 2-D character tries to understand what's going on but remains puzzled. To cheer him up, Peach gives him her parasol to play with, which enthralls Mr. Game & Watch. Thus, the Halberd team is formed, consisting of Lucario, Snake, Peach, Zelda, Fox, Falco, & Mr. Game & Watch, with Meta Knight in control. Meta Knight proceeds to land the Halberd to meet up with the heroes on the ground and those who evacuated from the Isle of the Ancients on the Falcon Flyer. Mr. Game & Watch then joins the player's team. After Battleship Halberd Bridge is completed, all characters that boarded the Halberd & that were forced to team up to battle Duon become one team. When the player goes to previous stages, the character selection screen at this point of Subspace Emissary will group them in teams, with Mario's team being in order, and Meta Knight's team repeating the same process, leaving the last 2 groups (Samus, Pikachu) & (Donkey Kong, Captain Falcon, Olimar, Diddy Kong) to team up in the oncoming levels before the characters the player has at this point team up as one to invade Subspace. This is one of the only levels without doors, along with Midair Stadium, The Ruined Hall, and The Canyon. Even in the first playthrough, the player can choose to play as Zelda via Transform, despite the cutscenes picturing Sheik instead. This page was last edited on November 9, 2018, at 15:22.